Have you put up your Spring Banners? › Who We Are › Our Blog › Have you put up your Spring Banners? An exceptionally pleased client sent along this pic of their newly installed banners. Great eye catching design created complimentary by the expert in-house artists at Downtown Decorations, with a focus on seasonal branding. Not just a beautiful picture - While the picture and banners themselves are quite stunning - the true beauty of this picture is that epitomizes the old line "a picture is worth a thousand words". From concept through creation - Downtown Decorations works with the client to develop clear goals, objectives, and preferences to create a unique one-of-a-kind custom design that is sure to please the eye and meet the budget. 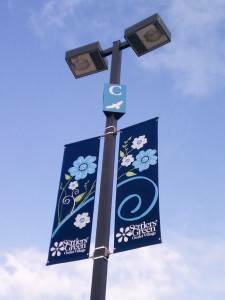 Following the design phase - Downtown Decorations produced the custom banners in record time (typical lead time on custom banners is approx. 3 weeks) and further assisted in the implementation and installation of the banners by providing specific and detailed instructions as well as complimentary phone support (rarely taken advantage of as a result of ease of installation - however happily provided with each and every order). As stated earlier - this is a great picture for many reasons - the banner installation was completed flawlessly and quickly. Banners appear taught and well mounted! Contact Downtown Decoration at: 1.877.369.6332 to learn more or get started on a new banner project!